A French archaeologist and maritime explorer named Frank Goddio was minding his own business; he was simply prepping for his final dive in Egypt’s Bay of Aboukir. He was below ten meters of murky water in Mediterranean and about four miles away from shore. 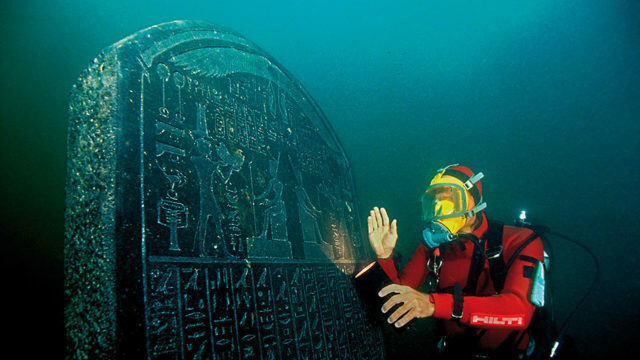 The 68-year old was the director of the European Institute for Underwater Archaeology. That day he abruptly came across the giant block of granite. He opted to swim closer to investigate it more thoroughly. Goddio was so focused that he was not deterred by the swirling current or the threat of sharks. He tried to clear off the sand that was covering the stone, and too his shock a giant toe came into view. It was the foot of a pink granite statute of Hapi, and one of seven pieces of it. This was just the beginning of what Goddio and his fellow team members were able to discover. There were hundreds of incredible objects recovered from the sea bed in 2000 and 2001. 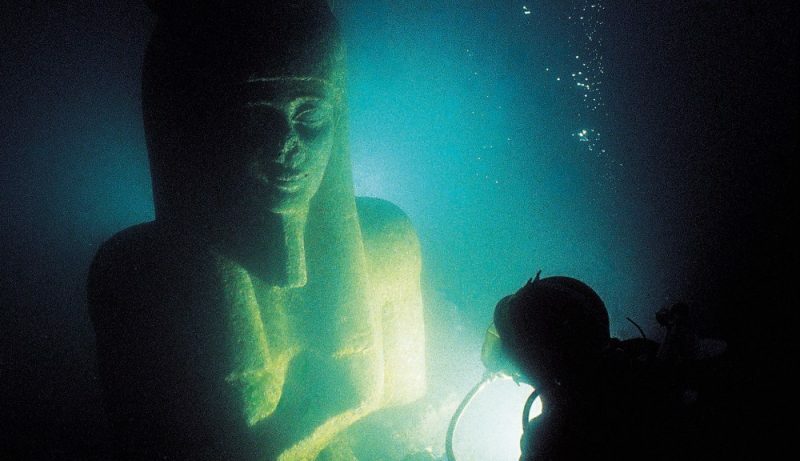 The lost and ancient cities of Thonis-Heracleion and Canopus had finally been found. Thonis was the main entry point for goods coming into the country prior to the creation of Alexandria. These cities date back to the 8th century BC at the mouth of the Canopic branch of the Nile. The city was linked by canals to nearby Canopus, seat of the cult of Osiris. Alexander the Great took over Egypt (conquered) in 332 BC. This was the start of the Greek Ptolemaic dynasty and eventually led to the rule of Cleopatra. These cities served as key areas of influence for the Greco Egyptian culture that emerged. However, it was roughly 80 BC when the sea swallowed these cities up and killed thousands of people in the process. Goddio spoke of the many human remains pinned underneath fallen blocks and found in the toppled temples. It is a poignant discovery. This sea-based disaster crushed the Hapi statue into seven pieces. But Goddio is an expert and he knew this was a valuable, once in a lifetime find. These findings are being brought to London for the British Museum’s blockbuster Sunken Cities exhibition. The statue was enormous, as evidenced by the individual pieces. It would have been 5.4 meters and weighed six tons! Moving this statue from a horizontal position to a vertical one requires trained technicians to hoist it on pulleys attached to the structure of the building. Then it has to be guided into position with the use of large pressurized pads. It is amazing how well preserved many of the findings are. The bed of sand protected it from decay and the sea protected it all from thieves. Faces look freshly carved. This is another example that demonstrates how remarkable Egyptian society was. An RAF pilot who flew over the bay in 1933 saw dark shadows in the water, and actually told a member of the Egyptian royal family who had land bordering the sea. The family responded by sending a diver down into the area. He found and came back with a stone head of Alexander the Great. Goddio said, “I knew from ancient texts that Thonis-Heracleion and Canopus had existed. There was an obvious reason why the cities had not been discovered on land. It was because they could not be on land.” Herodotus was an ancient Greek travel writer who had claimed there were impressive temples there, and then the pilot’s story fueled curiosity and suspicions. It is a weird concept to think of cities buried underneath sand and waves. Goddio narrowed down his search of the cities in 1996, focusing on the Bay of Aboukir near Alexandria. However, three years passed by without any discovery, despite a thorough look at the ocean floor. He admits this was a discouraging and difficult time.